Just two days after Germany’s outspoken vice chancellor (who has over the past 48 hours slammed not just Merkel’s refugee policy but also Brexit negotiation demands), announced that Obama’s transatlantic trade treaty, the TTIP, is dead, saying negotiations have failed because “we Europeans did not want to subject ourselves to American demands”, France voiced its support to the German position when the French trade minister on Tuesday called for an end to trade negotiations between the European Union and the U.S., the firmest sign yet of opposition in Europe to what would be the most ambitious trade deal in decades. Matthias Fekl, cited by the WSJ, said on French radio that “France no longer politically supports these negotiations,” adding that “The Americans are giving us nothing. This is not how allies should be negotiating.” Fekl said he would ask the European Commission, the EU’s executive arm, at a meeting of trade ministers late September to end negotiations over the Transatlantic Trade and Investment Partnership, generally known as TTIP. The Commission leads talks with the U.S. for the EU. “There should be an absolute clear end so that we can restart them on good basis,” he said on RMC Radio, adding he would suggest that course to fellow ministers. 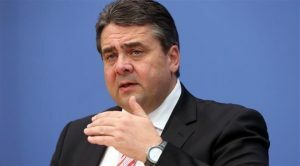 Fekl echoed the position of Germany’s econ minister Gabriel who said on Sunday that TTIP negotiations had effectively failed after Europe refused to accept some U.S. demands. Gabriel is the chairman of Germany’s Social Democrats (SPD), who share power with Chancellor Angela Merkel’s conservatives. While many German Social Democrats have serious reservations about TTIP, Merkel backs the talks: her spokesman insisted on Monday that talks should continue, while Germany’s Foreign Minister Frank-Walter Steinmeier – also a member of the SPD – said on Tuesday that both sides were still far away from agreeing on standards and procedures. However, with the French veto it seems that Merkel is now out of luck. Fekl’s comments show how skepticism of trade deals is surging on both sides of the Atlantic. In the U.S., President Barack Obama faces a tough battle in Congress to pass another major trade deal, the Trans-Pacific Partnership. Donald Trump and Sen. Bernie Sanders bolstered their support during the presidential race by strongly opposing trade deals, putting pressure on Democratic nominee Hillary Clinton to adopt a more skeptical stance on trade. In Europe, politicians in the bloc’s biggest economic powers, France and Germany, find themselves under fire for supporting negotiations with the U.S. Marine Le Pen, the head of France’s right-wing National Front party, has repeatedly attacked President François Hollande for backing the talks. Three years of TTIP negotiations have failed to resolve multiple differences, including over food and environmental safety, but the USTR’s spokesman told German magazine Der Spiegel the negotiations “are in fact making steady progress”. The deal is expected to eliminate almost all tariffs and reduce regulatory red tape that acts to limit trade, establishing what would effectively be a vast, trans-Atlanic free-trade zone. But fears have persisted in Europe that the deal will require the region to accept U.S.-backed technologies, such as biotech crops, that the region opposes. The White House has said this week it aims to reach a deal by the end of the year. “It’s going to require the resolution of some pretty thorny negotiations, but the president and his team are committed to doing that,” White House spokesman Josh Earnest told reporters in Washington. Meanwhile, the European Commission also remains upbeat. Although trade talks take time, the ball is rolling right now and the Commission is making steady progress in the ongoing TTIP negotiations,” the executive’s spokesman, Margaritis Schinas, told a news conference in Brussels on Monday. Supporters say the TTIP could deliver more than $100 billion worth of economic gains on both sides of the Atlantic, according to Reuters, but critics say the pact would hand too much power to big multinationals at the expense of consumers and workers. It would also likely result in even more mass layoffs.